RePublic Brewpub: Foiled Again (in a Good Way)! Go ahead and disregard any past mention of May 29th, 2009. Jane and I may be able to fund the business with less than 25% equity, but it's going to take some time to figure out. Hopefully it won't take a lot of time, i.e. weeks instead of months, but I'd say we're fairly committed to applying for bank loans. 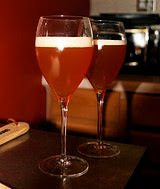 In other news, the most recent House Ale turned out very well. Score one for brewing session beers with low mash temps and lots of Munich malt. I have a couple more recipe tweaks to try, but I'm not sure when I'll get the chance. My appointment to the high office of 'dad' could happen any day now!